Myth #1 Kids need to be socialized. Do I really need to address this one? While it has been shown over and over again that homeschooled children are better socialized, better behaved, and better able to relate to wide variety of age groups, the question of socialization is still the number one objection homeschoolers get from critics. Children who are given opportunities to interact with and serve other people of all ages are better prepared to live in the real world where we are not age segregated! How can confining children to only those who are close to their own age help them learn to respect and get along with people of diverse ages? In the real world we deal with people of all ages. Myth #2 Everyone else is doing it better. It is easy to assume other homeschool moms are: more organized, better teachers, more competent, etc. God gave you the children He did because He put within you exactly what they need. He wants you to share YOUR uniqueness, strengths, lifestyle, hobbies and gifts with your children. Of course mom should always be striving to improve and to seek God for His will and guidance. Trying to fit our children into a particular curriculum just because we heard it was the one “everyone” else is using is a recipe for burnout. Comparing ourselves to others is a worldly, and frankly fairly low standard. Our standard should be to seek what God is asking us to be and do. Myth #3 Successful students get good grades – being able to pass a test does not mean a child has mastered the information. The bible says you shall know a tree by its fruit (matthew 7: 16 – 17). Does the child exhibit the fruit of understanding and wisdom? Memorizing and parroting back facts does not necessarily mean they have understanding. Grades are a not an objective measure of achievement. 80% on a math test may look like an okay grade, but what if that 80% is not sufficient mastery to give a child what they need to understand the next level of math? What if those 80% of the questions that were answered correctly represent only one tenth of the material covered in the lessons? Some students are very good at “reading” the test and getting the gist of how the test author wants things answered. These students can do very well on the test without ever really understanding the information. Myth #4 Finishing the book – Is our goal to finish all of the reading and the assignments or is it to raise up our children in the way they were meant to go? 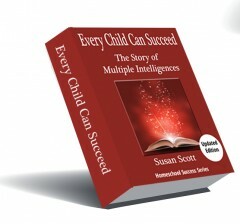 Any child can march through the reading, fill out the worksheets and complete the projects. That is just like putting in your time in jail. But have they really learned anything? Pick and choose the parts of the curriculum that benefit and support the goals and objectives you have set for your individual child. Seek to understand the ways in which God created them – the strengths, gifts, interests He put within them and set goals for maturing those gifts, building those up. Use the curriculum as a tool to support and meet those goals. Myth #5 The best curriculum is the one which is most popular today. Many curriculums purport to give “exceptional results” or to be “comprehensive and well-rounded.” If they do not meet your children’s learning style or needs and they don’t mesh with your lifestyle, they will produce only frustration and tears. Myth #6 Children need a “well rounded” education. 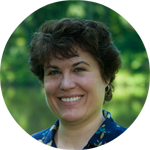 Although this sounds wonderful and an admirable goal (in fact, many curriculums tout their ability to create well rounded students) what does that really mean? It is usually the politically correct term for exposing our children to every deviant, pagan, and unbiblical behavior there is all in the name of learning tolerance. There is a place and a time, determined by the parents understanding of their child’s maturity level, for explaining other believes and practices, it should only come after a child is well grounded in truth. Myth #8 Our ultimate aim is academic excellence. In reality, the best educated child in the world is useless to God if they do not have a foundation of good character. We all know well educated, rude, self-serving people. They neither glorify God nor edify other people. Education without character produces little Pharisees. A child who has learned and received respect from their parents will have a much more enjoyable, harmonious, and fruitful, homeschool experience. Myth #9 The best homeschool teachers are those with a teaching degree. Homeschool Moms who have been public school teachers are almost unanimous in their agreement; they have had to “unlearn” much of what they were taught in college about how to educate children. A teaching degree is, more correctly, a degree in crowd management. The best teacher for any child is a loving, involved, parent. Universities tend to teach one particular method for educating children (whichever one is currently in vogue and politically correct) and ignore other methodologies. They completely discount individual learning styles. Well, if not completely, they only give lip service to the idea. It is patently impractical, in a room of 24 to 30 kids, to teach every subject using every possible method just to be sure you are teaching to the learning style of each child. Secondary to this is the myth that mom has to be able to teach every subject, including advanced math, sciences, language etc. There are innumerable resources for finding help either on-line, through tutor at the local college, friends with specific skills, people in the community, and many more. Seek God and He will provide a way. Myth #10 Homeschooling makes it impossible for a child to get in to college. The truth, according to several recent surveys of college admission advisors is that homeschoolers are getting in to college at a higher rate than public schooled children. Several colleges and military academies are actively recruiting homeschool students because they are seeing a much stronger educational foundation in those children. The enemy prowls the earth seeking those he can kill, destroy and discourage. 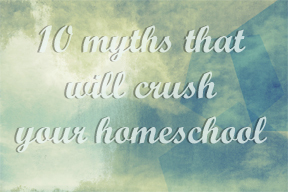 Don’t let your homeschool effort fall prey to these sneaky myths!